An aerial view of Hammond during the flash flood of September 2010. Photo courtesy of Micheal and Tina Mann. 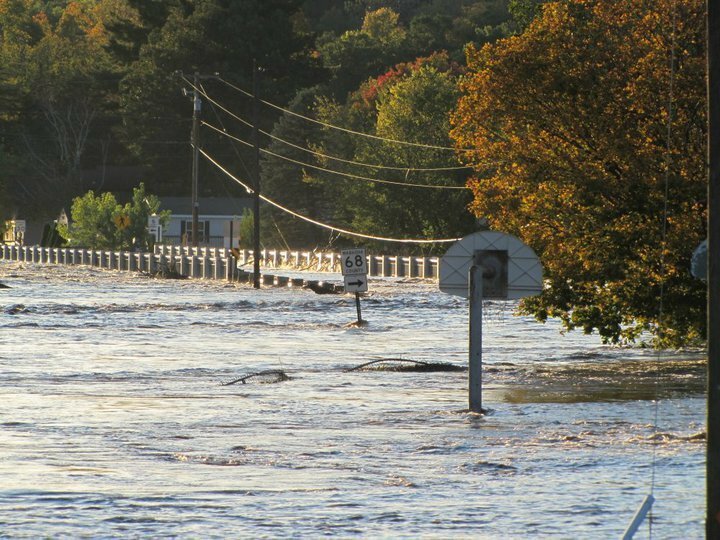 NEARLY A YEAR AGO, residents of Zumbro Falls and nearby Hammond were evacuating their homes during a devastating flash flood. 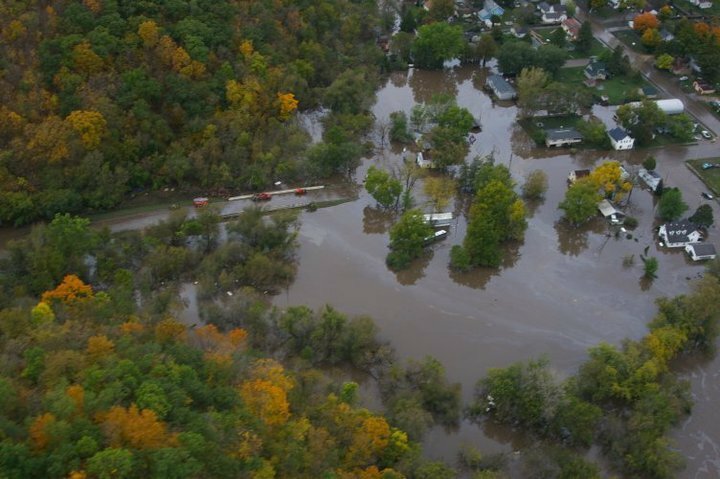 They were not prepared—could not have been prepared—for the rapidly rising Zumbro River that would inundate their homes and businesses on September 23/24, displacing them for months and many of them permanently. Within three weeks of the flooding, while on a Sunday afternoon drive to view the fall colors, my husband and I drove into Zumbro Falls. There I met Jackie, Tracy and Susie. 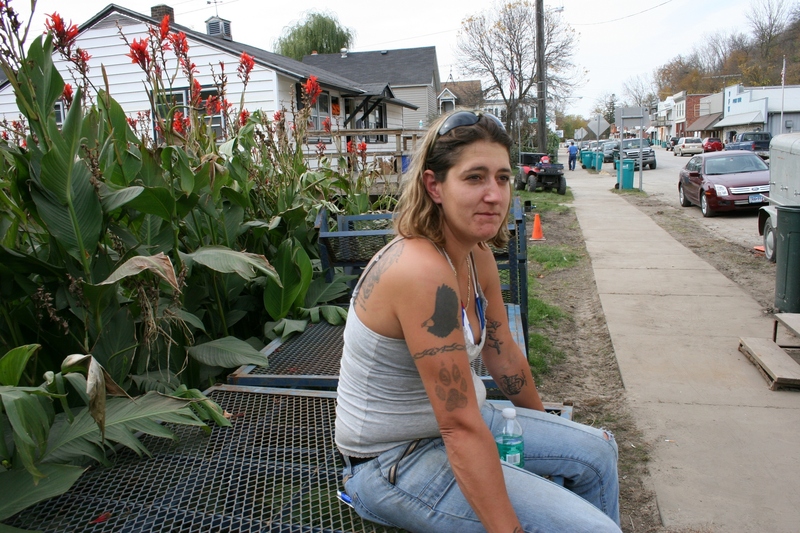 Just down the road in Hammond, I met Katie. Tracy Yennie of Zumbro Falls, whom I photographed shortly after the flood which left her without a home and living temporarily in a shed. These four women shared their stories and frustrations and worries with me. In return, I published what I today consider some of the most powerful posts I have ever written. Click here to read this flood series published on October 11, 2010. Flooding in Hammond, one year ago. Photo by Susie Buck. My coverage of the flood did not end then. These women so impressed me with their fortitude, their strength and their outspokenness that I continued to follow one of them, Katie Shones of Hammond, throughout the year. Katie was my go-to person any time I wanted an update from her Wabasha County community of 230. Not once did she suggest that I was intruding into her life. In fact, she has gone above and beyond in answering my many questions. She also introduced me to her dear friend, Tina (Marlowe) Mann. Tina and I have never met, but we’ve corresponded numerous times via e-mail. Like Katie, Tina has always, always, been forthright and open with me. She allowed me to share her story in a March 13-19 series. Click here to read the first of those six posts. Via my connections with Katie and Tina, I was able to inform you of the need for volunteer help in Hammond. And at least two readers responded with crews to assist in Hammond. Others of you may have responded in ways that I’ll never know. This weekend Hammond is celebrating its recovery with a “Thank You” party. “We would like anyone who was impacted, donated, volunteered, or showed compassion for Hammond to come back down and see how far we’ve come and allow us to show our appreciation – the Hammond way!! !” Tina wrote in a recent e-mail. She invited me to attend and said I could spread the word. So, if you fall into that “impacted, donated, volunteered or showed compassion for Hammond” category, make your way to this picturesque riverside berg on Saturday, September 24, to celebrate with Tina and Katie and their families and the other residents, and former residents, of Hammond. The first day back into their flooded Hammond home, Vicki and Dallas Williamson had 20 minutes to grab whatever they could carry on the back of a four-wheeler. The family did not move back. Photo by Sheri Ryan. Tina, who now serves on the city council; Hammond Bar co-owner Janice Farris; Hammond Café co-owner Cindy Campbell; former Mayor Judy Radke; and flood-affected resident Beau Mischke did the initial planning for the party and pulled in many local residents to help with activities, according to Tina. Also, live music by Led Penny and Bad Logic and fireworks at dusk. As you might guess in a small town, the entire event and door prizes are being covered by donations from businesses, residents, friends of Hammond and clubs. I’m not going to list them for fear of omitting someone. Suffice to say you would be impressed. And just one more thing. Tina tells me that by the end of the month, 12 crab apple trees will be planted on Main Street and in the east end of the park in honor of the children of Hammond affected by the flood. Those, too, have been donated, by a Rochester nursery and garden center. 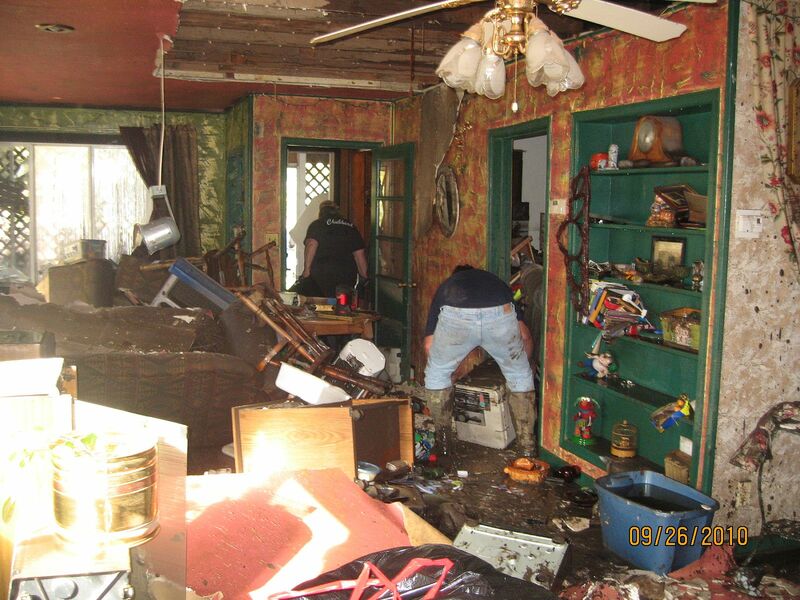 Click here to read an earlier post about the affect of the flooding on Katie Shones’ children. 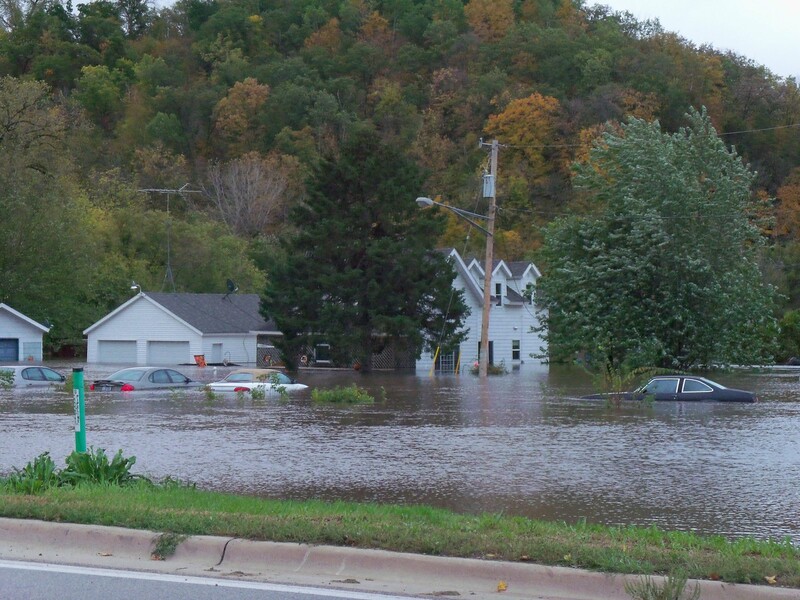 I never doubted that the folks of southeastern Minnesota would rebound from the devastating flood of September 2010. I knew it when I met Jackie, Tracy, Susie and Katie. These are strong, determined women. Nothing would stop them from reclaiming their communities. The bridge connecting east and west Hammond is barely visible during the flood, which also overtook the town's park. Photo courtesy of Micheal and Tina Mann. CHECK BACK FOR A POST tomorrow in which Tina Mann shares her thoughts on the past year and how her community has worked toward recovery. As in the past, Tina speaks with an honest, open voice that will touch your heart. Sheri, it’s OK to cry. Really. Tina has such a gift for sharing her thoughts and insights that truly touch the heart. It has been my honor to continue to cover “the story” of Hammond. I couldn’t have done it without the input of you and so many others, especially Tina and Katie Shones (whose thoughts I will feature here tomorrow). As a side note, MinnPost’s “Minnesota Blog Cabin” picked up this post as today’s featured story. So that means an even wider audience will hear Hammond’s story through Tina’s voice. I too got a wee bit teary. You are sooo right in recognizing the strength & fortitude in these women. I know Susie Buck personally, & know that her plate was pretty FULL B/4 the flood. It is the perfect proof of the old addage: ” IF IT DON’T KILL YA, IT MAKES YOU STRONGER!” The residents of this little town grew their families ten times bigger & I’ll be there with bells on! I planned to attend the party, but because of two unexpected, tragic deaths in my extended family, cannot be there to celebrate with the good people of Hammond. I’m certain it will be a memorable day with tears and laughter. Once again, thank you for your continuing and extended coverage of the September 23-24, 2010, flood. The lives of the people in Hammond, Jarrett, Zumbro Falls, and surrounding areas have been changed forever by this tragic event. However, these flood survivors have done what mid-westerners do best – pulling themselves up by the bootstraps, forging ahead, and helping eachother. The sense of community is stronger after the flood than before. You’re welcome, Katie. You know how I’ve felt about the importance of keeping Minnesotans informed about Hammond so you weren’t forgotten. None of this coverage would have happened without you and then Tina, too. I admire both of you. I truly do. Yes, this was truly a freak event. And it had its effects on all of us. Not good for sure. However, when things got bad we ALL stepped up and showed what we are made of. I, for one, am extremely proud of everyone affected and the huge progress that we have all made. As I look around the area I see huge improvements everywhere. How could anyone NOT be impressed? If the media wants to help, they need to quit coming to town every time it rains thinking they will find a bunch of panicing residents that are afraid it will happen again. This type of media is the worst thing they can do to us. We haven’t had water on Main St. in over 60 years, and then we didn’t have our dike. This was a freak of nature, that most likely will never happen again. I personally have NO fear of another flood. NONE. My flood ins. co. gladly re-insured me and my premiums dropped $100 per year, so the statistics must be on our side. Friends, the fellow affected, all you people I’m so proud of, it’s time to put this behind us. If we want to grow as a community, it’s time to move on. We have more than proven that we are above this. Thanks so much for stopping by to share your perspective on the flood and recovery. Natural disasters like this affect everyone in different ways. But the common denominator I’ve seen in the survivors (that I’ve communicated with) of the southeastern Minnesota flash flood is their strength. I’m now adding you to that list.